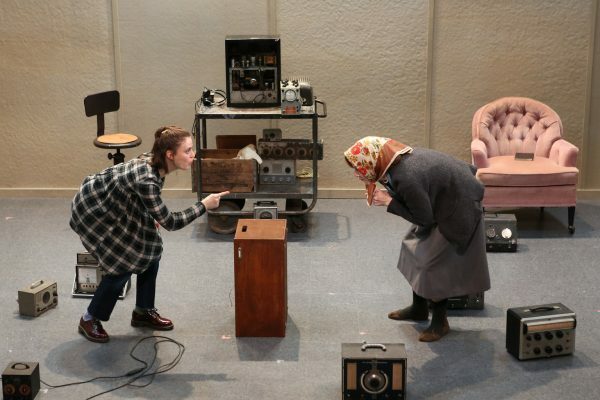 Loren Noveck reviews New Georges’ sound play about the electronic music pioneer Daphne Oram. New Georges characterizes its two plays running in rep this month as “steeped in sound.” In This is the Color Described by the Time, creator Lily Whitsitt amplifies the mental and emotional processes inside Gertrude Stein’s head, and pumps them into headsets worn by the audience, to give us a soundscape of her mind. In Stephanie Fleischmann’s Sound House, sound, used as either echo or counterpoint, establishes both atmosphere and mood. It’s surprising how rare and refreshing it feels when sound–designed in Sound House by Tyler Kieffer and Brandon Wolcott–like lighting, is considered as a given, always present, always accompanying the action. But sometimes the design elements (particularly Kate McGee’s lighting, Brendan Spieth’s movement, and JB Douglas’s props along with sound) seem to be the only things connecting the different strands of story and character, and it doesn’t always feel like enough. Sound House centers on the almost-unheard-of electronic music pioneer Daphne Oram (Victoria Finney), whose Oramics machine was one of the first instruments to synthesize electronic sound. After working as an engineer at the BBC for about fifteen years (beginning during World War II), Oram set up her own workshop in the English countryside and continued experimenting with and inventing new technology for sound production. Fleischmann picks up Oram’s story later in her life, when she’s fallen on considerably harder times; her Daphne is hosting concerts of recorded classical music in her garden as a means of procuring enough small income to keep her house/workshop barely habitable, and she’s also descended a bit into paranoia. (Finney does a nice job balancing Oram’s steely practicality and brilliance with the vulnerability of isolation, poverty, and sense of her own obsolescence.) Fittingly, perhaps, her anxieties manifest auditorily–phones and doorbells ringing in the middle of the night, with no one to be found at the other end of the line or other side of the door. Kieffer and Wolcott’s sound design is exceptional–omnipresent but subtle, immersive but not intrusive, encompassing everything from modulating voices to representing the Oramics machine and other inventions to more literal sound effects like Daphne’s mystery doorbells. Marsha Ginsberg’s set and JB Douglas’s props, too, fill the space with tangible evocations of sound: bricks of analog-era that work as much as architectural elements than practical recording devices. Director Debbie Saivetz has the actors frequently engaging with the sheer heft and physicality of these objects: reel-to-reel tape recorders, record players, oscillators, the Oramics machine, and other things I can’t even identify, really calling attention to the materiality of the sound. The curious thing is, in a play anchored in sound, the themes circle more around visibility and invisibility–Daphne’s invisible intruders and callers and Constance’s sense of disappearing; even the play’s third (minor) character, Horace Ohm (James Himelsbach), an engineer who once was Daphne’s protege, has a wife who threatens to disappear from Daphne’s view, as she’s unable to remember the wife’s name or recognize her. There’s a disjunct that’s hard to reconcile; it feels like there’s an opposition between the metaphors/themes and the physical focus of the show, and the two polarize rather than fuse into a whole. Similarly, Constance’s story and Daphne’s don’t always speak to each other in productive ways. (There is a tangential narrative connection made via Constance’s mother, the Rolling Stones, and Francis Bacon, but it’s almost incidental.) Wisps of theme draw them together, as do the design elements. But both stories are stronger in ambience and memory than in present action. Without strong narrative drive, the character portraits drive the play, and the overlaps (plus a few imagined actual interactions) between Constance and Daphne don’t give them enough connection or commonality to hold the piece together. It’s a theatre piece that succeeds in some intriguing and unconventional ways, and certainly fulfills its promise to highlight the sound elements, but doesn’t end up delivering a fully satisfying experience. Sound House runs in repertory with This is the Color Described by the Time, a soundscape of the creative and emotional minds of Gertrude Stein. Sound House runs until March 4, 2918. More production info can be found here.